In this note it described three cycle routes Finland, rings from town Myllykoski (Kouvola). First route of 54 km is along the banks of the river Kymijoki. We have used it several times as a backup when unstable weather. Therefore, there is no photo from this route. 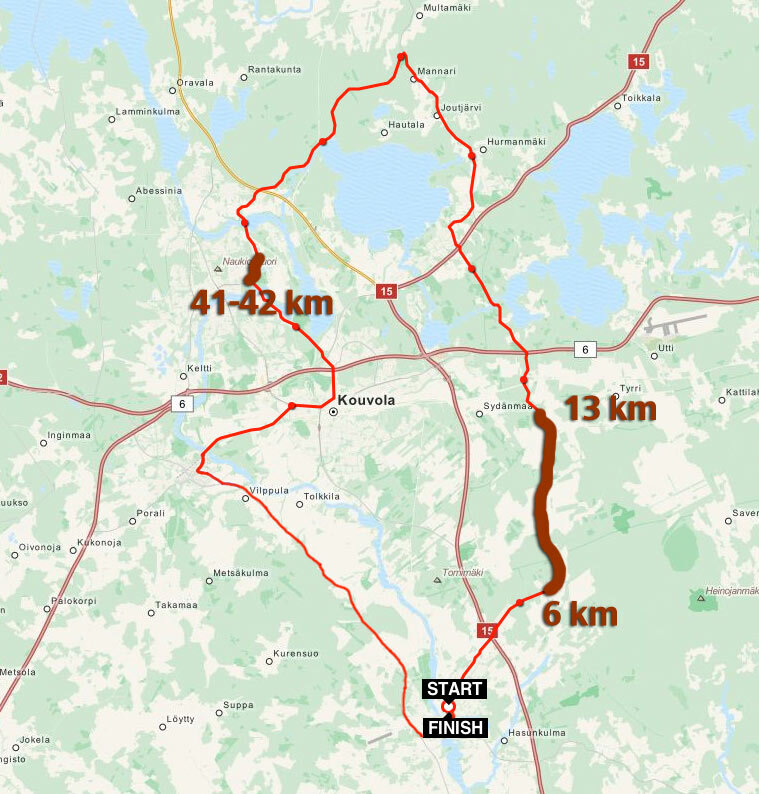 The route is the development of the warm-up ring of 22 km. The good news is that in the middle of the route is the point of return, right near the hotel. Anyway, if the rain will cover, the return is not very far. In principle, the route is very nice, easy going, quite beautiful and goes in civilization. All the time in the view are fields, farms, villages, towns. 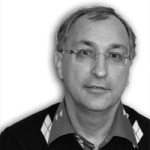 At begin we going to north along bank to Kouvola and slightly touch the city. Then we move to the other side of river and go to the south. In the south, we pass the towns satellites on different banks (Anjala and Inkeroinen), a consequence of the border (Sweden-Russia) river, and then back along the railway. Here is the track (opens in a new tab). 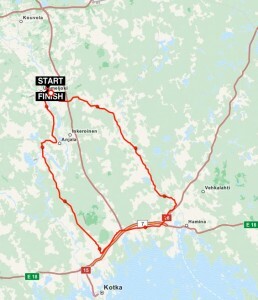 Next route, 84 km, is perhaps the most impressive. Firstly, we are going to the sea. Second, it is a significant difference in the weather. In Myllykoski it was rainy and cold, while forecast shows that in Hamina it is warm and sunny. And so it was. At third, just very beautiful. 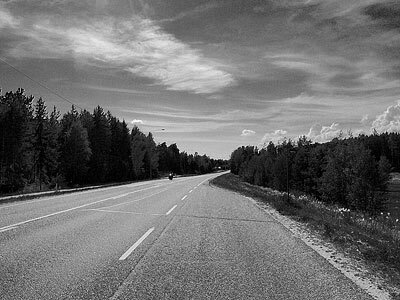 From Hamina to Kotka time to time there were signs “Royal Road”, an old post road Swedish values. That case when only pedaling assumed that you loose something:) It was wanted to drop to circle square in ​​Hamina, turn to Kotka, but the pressure of distance of 84 km kept on the route. And Garmin would began to swear 🙂 However, we usually did not twisted pedal the whole day, so then jump to the car and drove like auto tourists for sights. Track. Route 71 km to north of Myllykoski was laid to enjoy the drive around a large lake 🙂 Lake was not seen from road, alas, but there was sense of resort area. Generally, from the road (and by bicycle, by car) is not particularly visible powerful geographic noteworthy: rivers, lakes and the sea. Probably so conceived, the road is only for go. Caught in the areas with granite crumbs (marked on the map in brown). In the photo – the first section. The second portion is connected with a detour of big factory. The main road leads to the factory (impressed inscriptions in Russian, pointers for drivers ). The factory itself is very beautiful and is built in an old factory area. 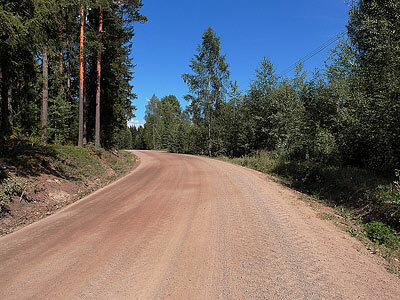 Then we pass the corner of Kouvola and return back on the road section of the route “54 km” (the first on this page). Track.